Discussion in 'Samsung Galaxy S4 - ATT SGH-I337' started by Kagedws6, Jan 14, 2015. WARNING 1 -- ALL GUIDES BELOW WILL WIPE YOUR DEVICE. Make sure you have you data backed up before attempting. WARNING 2 -- Follow these guide at your own risk. Everything worked for me, but... NOTHING IS 100% GUARANTEED. -- wants to return their phone back to stock. -- was told to “Odin back to stock” in another thread. -- is bored and wants to start fresh before flashing another ROM. -- Anyone who does not take the time to read the notes below and F.A.Q. 's in Post 2 before flashing. <ID:0/004> DO NOT TURN OFF TARGET!! These guides will walk you through flashing the factory stock image, upgrading to the selected firmware update, rooting, and installing Safestrap recovery. Thanks to [MENTION=4708661]muniz_ri[/MENTION] as these are based off his instructions. Odin -- Odin v3.09 -- XDA thread. Download from here. NJ4 update -- 2400258.zip -- from here. 5. Right click Odin and run "as administrator"
8. Phone will reboot when complete... You are now on STOCK NB1!!! 3. Phone will reboot when complete... You are now on STOCK NJ4!!! 4. Select "apply update from external storage"
6. Phone will reboot when complete... You are now on STOCK NJ4!!! 6. Open My Files app, browse to tr.apk, click it, and install. 7. Open Towelroot and click make it ra1n... You are now rooted!!! 8. Open My Files app, browse to Safestrap-JFLTE-3.72-kk-B01.apk, click it, and install. 9. Open Safestrap and click Install Recovery... You now have recovery!!! 12. Phone will reboot when complete... You are now Rooted on NJ4!!! Note 1... SELinux Mode Changer from the Play Store... does not work with NJ4. Make sure to use Towelroot v3. Note 2... Once you Odin back the NJ4 kernel, the Safetrap app will force close if opened, but the Safestrap menu continues to exist on reboot. 6. Phone will reboot when complete... You are now on STOCK NI1!!! 12. Phone will reboot when complete... You are now Rooted on NI1!!! You are now ready to flash a KitKat ROM. See Post 2 in the Index for list of compatible ROMs and installation instructions. Make sure to use the ATT_NI1_modules as you are on the NI1 kernel now. Thanks to [MENTION=4980764]Maribou[/MENTION] as these are based off his instructions. 6. Phone will reboot when complete... You are now on STOCK NC1!!! 3. Open My Files app, browse to tr.apk, click it, and install. 4. Open Towelroot and click make it ra1n... You are now rooted!!! 5. Open My Files app, browse to Safestrap-JFLTE-3.72-kk-B01.apk, click it, and install. 6. Open Safestrap and click Install Recovery... You now have recovery!!! You are now ready to flash a KitKat ROM. See Post 2 in the Index for list of compatible ROMs and installation instructions. Make sure to use the ATT_NC1_modules as you are on the NC1 kernel now. 8. Phone will reboot when complete... You are now on STOCK MK2!!! 1. Go to Settings > More > About Phone... Tap Build Number repeatedly until developer mode is enabled. 4. On PC, unzip saferoot.zip, and browse to folder. 5. Run install.bat and follow prompts. (phone will reboot) You are now rooted!!! Open My Files app, browse to Safestrap-JFLTEATT-3.71.apk, click it, and install. 2. Open Safestrap and click Install Recovery... You now have recovery!!! You are now ready to flash a 4.3 Jelly Bean ROM. See Post 3 in the Index for list of compatible ROMs and installation instructions. Make sure to use the MK2 modules. These Guides will return your phone to factory stock image. May need this if you no longer require root, are taking your phone in for service, or selling it. 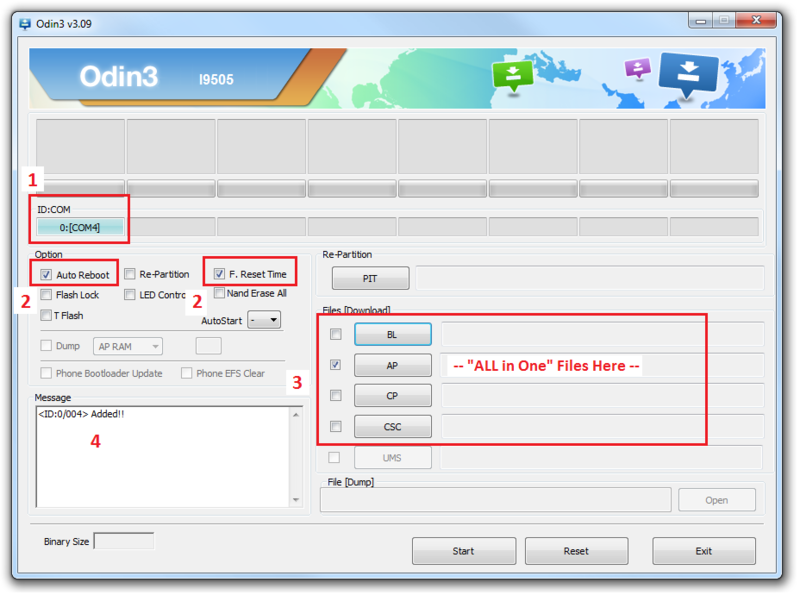 Odin is a 3rd party program that can restore your phone to factory settings. Do I need to take my SIM and SdCard out? If you follow the directions and everything goes as it should, neither your SIM or SdCard will be affected. I, personally, leave both in and have never had an issue. Worst thing that can happen is you loose the data on your SdCard and/or you need to go to ATT for a new SIM card... Your call. What is the difference between these instructions and the ones found in other threads? Some are the same and the others might use different files. I'd like to think they are more detailed than some of the others out there. Besides, These are the steps I used and I know they work. I have a different tar file. Can I use that one instead? Sure. It's your phone, you can do whatever you want... But if you have problems, don't look at me for help. These instructions are specific to the files I have referenced. Different tar files may yield unexpected results. I’m on MDB or MDL base, why no love for us? You have an bootloader which can be loki'd to flash any kernel. If you follow any of the directions above, your bootloader will be permanently locked and you will be stuck with stock kernel. I took the NB1 OTA, can I Odin the MK2 files? Which recoveries can we use? If you are on MK2, NB1, or NC1 base, then you have a locked bootloader. SAFESTRAP is the ONLY recovery you can use. Safestrap won't install for me. The app installed fine, but it won't reboot into recovery. Did you try SELinux Mode Changer and set the mode to permissive? Some people need to do this... That's why it's in RED. What about those of us on MF3 that want to odin back to MF3 stock? Will these instructions work on a Mac? I'm rooted with Safestrap recovery installed. Now what? I have a rooted i337 and now I want to install safestrap - your cliff notes assumes that the phone is unrooted, and safestrap is applied before the NJ4 kernel. So what is the procedure if you are rooted and on NJ4 kernel and want to install safestrap. Thanks. This is the by far the best explanation on the web for rooting installing safestrap and ultimately installing a custom rom. BRAVO!! I installed safestrap 3.75 and at first was unable to gain access to the recovery mode. After searching I did find the solution to my problem. The creator of safestrap wrote that busy box is needed alongside safestrap to function. It was a simple install and no config on my part. Afterwards I was able to boot to recovery. 2: when going back to NB1 does it give you stock recovery as well? ODIN MODE" with other details I can't type right now but if needed I can.